The crowd joins in with Amy Nehlsen as she sings Christmas songs. Santa pulls the lever to light the Fulton Christmas tree. Ella Weaver makes a craft at Fulton’s Christmas Jubilee. Fifth ward city councilor Dennis Merlino hosts the evening’s performances. Members of the Fulton Athletic Boosters hand out hot chocolate. A line of youngsters await their turn to make several crafts. Lynnet Lamb, YMCA Child Care Director helps Mia and Lily Donahue making crafts. Santa arrives by special delivery from Fulton Fire Department. Kristy Richardson, 9, sits with Santa and Mrs. Clause. Carson Nesbitt, 2, sits with Santa and Mrs. Clause. Sophie Kinahan, 1, receives a gift from Santa and Mrs. Clause. FULTON, NY – A light flurry of snow created the perfect winter wonderland while Fulton kicked off the holiday season at the 15th Annual Christmas Tree Lighting Jubilee. Each year, the event features Santa’s arrival on a Fulton fire truck to lead an exuberant crowd in a countdown to light the city’s official Christmas tree. A line forms through the Municipal Building and out the door as children await their chance to sit on Santa’s lap, tell him what they want for Christmas, and receive a stuffed animal from Mrs. Clause. 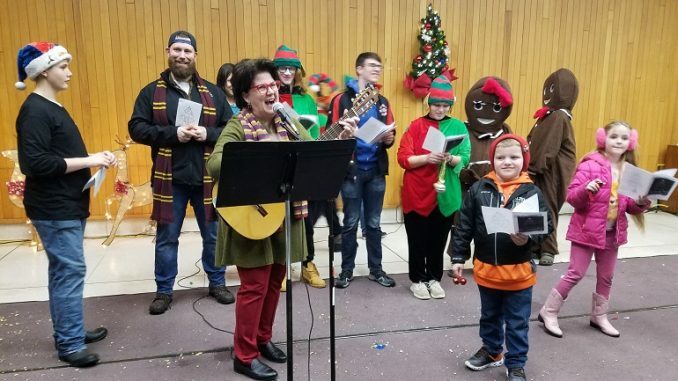 Beforehand, families enjoy free arts and crafts, several performances, hot chocolate, donuts, and popcorn with help from several community sponsors. Barry Ostrander, Superintendent of the Department of Parks and Recreation, said the event has grown to incorporate new experiences in its fifteenth year. This year, the jubilee included face painting, storytelling with the Director of the Fulton Public Library Caroline Chatterton, a magic show with the Twin Magicians, and a sing-a-long performance with Amy Nehlsen. Despite the freshly fallen snow, Ostrander was pleased with the event’s turnout. “People hung out even as the weather got a bit rough, but it really added to the festive mood,” he said. Without a single paid staff member, volunteers from various sponsors and local organizations allowed for a fun-filled evening. “We have always tried to incorporate the entire community with this event: the business sector, the school district, the church, and of course the city. It’s a great opportunity to provide a fun and festive holiday event, especially for our underprivileged families,” he said. With each year, the event grows stronger. “The community has supported this event each and every year, so it’s obvious that it’s enjoyed,” Ostrander said. Dunkin Donuts, Fulton Savings Bank, Fulton Athletic Boosters, Community Bank, Oswego Valley Insurance Agency, Fulton Alliance Church, Fulton Public Library, Fulton Family YMCA, Burke’s Do It Best Home Center, Mimi’s Drive In, Blue Moon Bistro, Fulton Lion’s Club, City of Fulton.